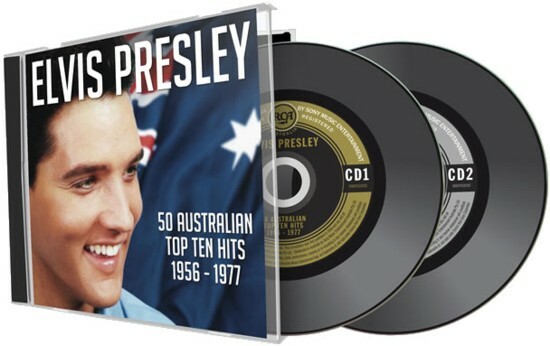 Sony Music Australia’s latest “Australia only” 2CD compilation has been released to celebrate what would have been Elvis’ 75th birthday. EIN put on the headphones and details what is right and what is wrong with what could have been a special release. While the audio Mastering is not credited on the sleeve notes the quality is just fine and appears to be the Vic Anesini 2007 Masters as used on "The King" etc. "New" greatest hits tracks that are included such as Do the Clam & (Such An) Easy Question are the same as on the Vic Anesini 2007 'Elvis At The Movies'. Similarly Ain't That Lovin' You Baby is the fabulous quality of Kevan Budd's work on 'Elvis Gold Records - Volume 2' although mastered at a little too high a volume here, presumably to help make it match the sixties tracks on the same CD. The cover artwork is attractive as are the two discs – one black and gold, one black and silver; the discs inspired by the original record disc from Elvis’s first LP, Elvis Presley. The inclusion of hits peculiar to Australia such as Do the Clam, Judy and (Such an) Easy Question is a major selling point for the release, but where are gems such as the always overlooked but sublime Ask Me (a #1 hit in Victoria in the pre National chart period); the poignantly sung There’s Always Me; soul classic Any Day Now; and uptempo hits, Rubberneckin’ and Patch It Up? Using these at the expense of several other “well overdone” hits would have really given the release a much greater different feel to the other “greatest hits” compiles. The track listing is a case of what could have been! The 20 page booklet is uninspiring. The liner notes comprise basic song, songwriter and chart position for each song and a more detailed description by chart expert, Gavin Ryan. As a result there are many wasted pages. Combining the song details with Ryan’s discussion would have been a more efficient use of pages and allowed the producers to include significantly more archival material. The booklet design is basic with far too much “white space” on those pages providing the details of each of the 50 tracks, giving them a ‘cheap’ feel. In the 18-page booklet only 5 feature any photos or memorabilia. Even then a number of visuals are either irrelevant to the release (e.g. Teddy Bear ‘EP’ cover – did they forget the release was about singles??) or could have been replaced with actual Australian written/published pr (e.g. many better options than using the New York Times flyer exist); while a number are reproductions of reissues, not the original release singles; and, generally, higher quality visuals were easily available had the producers gone to the effort. An important “missing” element is that given the nature of the release the booklet should have included how “Aussies” felt about Elvis and his music. The liner notes lack that sense of emotion, one which would have added appreciably to the narrative and made it more than bland, descriptive text. The liner notes contributed by chart expert, Gavin Ryan, are good, although the licence taken with chart placings needs to be noted. Despite what is suggested there was no National chart in Australia in 1956 when Heartbreak Hotel reached #3, nor was there one in 1965 when Do The Clam allegedly reached #4. The first recognised Top 40 chart was published in Australia’s iconic music publication, Go-Set, in 1966. Ryan’s chart placings are taken from a new National chart devised a few years ago by the David Kent organisation. Kent was responsible for the long running Kent Report, but when it created its own ‘historic’ National chart early in the new millennium it raised questions given the subjectivity applied to determine the placings. In the context of the liner notes accompanying Elvis Presley 50 Australian Top Ten Hits, to suggest there was a National chart between 1956 and 1965 is misleading and revisionist history! Do the Clam is a good case in point. It reached #6 on the NSW (Sydney) chart and #12 in Melbourne, yet Kent ranked it as reaching #4 nationally. This is very suspect (even with the song’s #1 placing in Brisbane) as the vast majority of sales affecting a national placing come from the two most populous states, NSW and Victoria. In the mid 1960s NSW and Victoria made up approximately 64% of the Australian population, while Queensland made up only around 13%. Even if there had been a National chart in 1965 it would have taken a mighty sales effort in all other States to push Do The Clam anywhere near #4! Similarly, the 1956 recording, Heartbreak Hotel, which broke Elvis globally, peaked at #3 on the NSW (Sydney) chart but not on a National chart. Not surprisingly, a number of Elvis identities and fans in Australia have asked why the liner notes were not written by a knowledgeable Elvis fan? EIN recommends Sony Music Australia look closely at the excellent booklets put out by Canetoad Records Australia Ltd. Well researched, informative and with ample archival material, they are the way to produce ‘special release’ booklets. Sony Music Australia is supporting Elvis Presley 50 Australian Top Ten Hits by TV and radio promotion although, so far, little TV promotion has been noticed. Booklet: High quality and relevant visuals should have been essential. Important elements of the original proposal to Sony in 1999-2000 for an Australian Top Ten Hits compilation were that the booklet would include a listing of Elvis’ Gold and Platinum Awards in Australia and reproductions of relevant reviews and articles from the Australian music press as well as reproductions of National Top 40 Charts. These would have been effective and simple ‘value adds’ to the compile. Marketing: The album was released for what would have been Elvis’ 75th birthday. This coincides with the world's biggest Elvis Birthday celebration, the Annual Parkes Elvis Festival in country New South Wales. With 11,000 Elvis fans invading Parkes you would think strategic marketing in Sony Australia would have automatically realised a golden opportunity existed. By attaching a 'Parkes 2010 Elvis Birthday' sticker and the album would have been the perfect souvenir at a price everyone could afford. This could have been a Number One Australian album! Instead the album was nowhere to be seen the whole birthday Festival. The Parkes organisers had not been contacted about it, the main Parkes record shop didn't know about it! As the bulk of the fans in Parkes were the “greatest hits” type buyers, the possibility of selling 4,000 or more copies of the album in a community celebration packed with Elvis, Elvis fans and more Elvis, was on offer. All it would have taken was a Sony Music Australia stand, some large promotional posters with give-away competitions at the “Parkes Main Stage” and available Club events. With January 8th being so close to Christmas, SONY also stupidly missed the possible, and all-too-obvious, cross-promotion to the Christmas sales! And for some strange reason, Sony Music Australia failed to involve the major Australian Elvis fan clubs in the development of the album, resulting in missed marketing opportunities and contributing to the album's flawed track selection and inadequate booklet. Also, in 2010, point of sale promotion seems a much better option than radio advertising in generating sales. Verdict: Elvis Presley 50 Australian Top Ten Hits could have been a special release. However, it is flawed by inadequate track selection, 'basic' booklet content and missed marketing opportunities. This is inexcusable given the release has apparently been two years in the making. "Elvis '75 Good Rockin' Tonight"